A funeral Mass was held Jan. 10 in the chapel at Villa Assumpta for School Sister of Notre Dame Mary Hilary Doyle. Interment followed at Villa Maria Cemetery in Glen Arm. 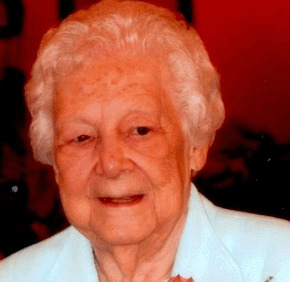 Sister Hilary, 95, died Jan. 5. A Baltimore native, Sister Mary Hilary attended St. Pius V School and then Ascension School in Halethorpe and the Institute of Notre Dame. After her final profession of vows in 1940, she taught for 13 years in Rochester, N.Y., before returning to the Archdiocese of Baltimore. Sister Mary Hilary taught eighth grade at St. Mary’s Elementary School in Annapolis, 1953-56; was a middle school teacher and superior at Our Lady of Fatima School, 1956-59; and was superior and principal at St. Mark School, Catonsville, 1959-65. She taught eighth grade at St. Mary’s School, Govans, 1965-68; served as principal at Mount Calvary in Washington, D.C., 1968-69; and was superior and principal at St. Margaret School in Bel Air, 1969-71. She taught in the upper grades at St. Pius X School in Rodgers Forge; 1971-74); at St. Mary’s School in Annapolis, 1974-77) and Madonna Middle School at St. Benedict’s Parish in Baltimore, 1979-82. Sister Mary Hilary worked as office manager and bookkeeper in the parish office at St. Matthew, Northwood, 1982-91, while living at St. Francis of Assisi convent and then St. Ursula convent, both in Baltimore. From 1991 to 2000, she worked in the Villa Assumpta finance office while living at the Regina Pacis Community at what is now Notre Dame of Maryland University. She retired to Villa Assumpta in 2000.